He was tall, broad-shouldered and bushy-haired. He spoke in a heavily New York-accented voice, and his speech was often laced with crudities and obscenities. He loved to strut in public, wearing $2,000 custom-made suits, and surrounded by a phalanx of tough-looking bodyguards. He loved being noticed, especially in restaurants and discos, by “my public.” Making the cover of Time magazine was probably the greatest thrill of his life. And he loved to brag: He was the toughest, the smartest, the guy nobody dared cross. And when he wasn’t bragging about himself, he was disparaging even his closest associates. He was rumored to be implicated in a long string of felonies. He knew the FBI was watching him. But he continually met openly with his cronies at the same place—a social club in Little Italy. He ordered his subordinates to be extremely cautious when they talked on the phone. But he totally ignored his own advice—and created a litany of incriminating tapes that would destroy him. No, he wasn’t Donald Trump. He was John Gotti, once the boss of the most powerful crime family in America. And he shared more than a few striking similarities with Donald Trump—another New Yorker who has since become President of the United States. Like Trump, Gotti spent a good portion of his time in court—although Trump’s 3,500 lawsuits (filed by and against him) completely dwarf Gotti’s four high-profile trials. And, like Trump, he loved to taunt the FBI agents he knew were stalking him. After each court victory he gave a press conference, claiming he had been framed by FBI agents who hated Italians. Warned to knock it off, to show humility instead of arrogance, Gotti told his would-be protectors to go to hell. He wasn’t going to be anything but what he was. Years afterward, the FBI learned the reason for the Teflon: Gotti had used jury tampering and witness intimidation to beat the rap. It was the fourth trial that did him in—and sent him away for life. Unlike Trump, he wasn’t born into a wealthy family, with a father who gave him $200 million to start his own real estate business. Instead, he grew up in poverty, resenting a father who worked as a day laborer and liked to gamble. He was born on October 27, 1940—almost six years before Trump (June 14, 1946). He turned to crime at the age of 12, working with street gangs affiliated with the New York City Mafia. By 1966 he had been jailed twice. He hijacked trucks at John F. Kennedy Airport. Arrested three times for hijacking, he pleaded guilty and was sentenced to three years at Pennsylvania’s Lewisburg Federal Penitentiary. Paroled in 1972, Gotti’s big break came in 1973. Emanuel Gambino, the nephew of the Mafia’s “Boss of all Bosses” Carlo Gambino, was kidnapped and murdered. Gambino sent a trio of hitmen—one of them Gotti—after the culprit: James McBratney. Although not the actual killer, Gotti was identified by eyewitnesses as a participant. Through a plea bargain arranged by attorney Roy Cohn, Gotti received a four-year prison sentence for attempted manslaughter. Cohn had earned an infamous reputation as chief counsel for Red-baiting Wisconsin United States Senator Joseph R. McCarthy in the 1950s. After leaving government service in 1954, Cohn went into private practice. Among his clients: Mafia bosses “Fat Tony” Salerno and Carmine Galante—and real estate mogul Donald Trump. Released from prison in July, 1977, after only two years, Gotti finally received his dream gift: He was fully initiated as a “made man” into the Gambino Family. 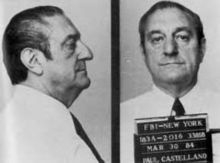 Gambino himself had died of natural causes in 1976, and was now succeeded by his son-in-law, Paul “Big Paul” Castellano. Gambino had represented the “old-school” Mafia: Men who shunned publicity like the plague and cultivated the image of a harmless small businessman. Although he had ordered his “soldiers” to steer clear of the drug trade, which brought too much heat, Gambino reaped millions from loansharking, extortion, hijacking, bookmaking and labor racketeering. Castellano sought to “legitimize” the Mafia by moving it into legitimate business. He launched Dial Poultry, a poultry distribution business that once supplied 300 butchers in New York City. He profited as well by supplying construction concrete. No one could pour concrete for a project worth more than $2 million without the approval from the “Concrete Club”—a mob-controlled enterprise. John Gotti, by contrast, was neither publicity-shy like Gambino nor seeking to enter the legitimate business world like Castellano. There was no point, he reasoned, in being a gangster if you weren’t going to act like one. For Gotti, those two traits—his love of publicity and desire to be “a real gangster”—would prove a fatal combination.